This large family chicken pot pie recipe makes four 11×18 pans! Our family of ten had this classic baked dish with a salad on the side and even some leftovers for the following day’s lunch. Add in 24 cups of chicken broth and 8 cups milk into the stockpot, stirring constantly and bring to boil. This will take a few minutes. Once boiling add in the 5 lbs of the frozen blend of peas, corn, and carrots. Next, add in the 8 lbs of precooked and shredded chicken breast. Once the chicken pot pit filling is complete layout premade pie crust in the bottom of your baking dish. The pie crusts were circle shaped, and I was baking in a rectangle pan. Don’t let this scare you. The pot pie will still turn out wonderfully! Lay two pie crusts side by side in the bottom on your baking pan. Fill the baking dish 3/4 of the way full with the chicken pot pie mixture. Top baking dish with two more premade pie crusts. As you’re able to pinch the edges of your crust together and cut pie slits. To bake directly place in a preheated oven at 350 for 90 minutes. *TO USE AS A FREEZER MEAL DO NOT PREBAKE* wrap your chicken pot pies with two layers of foil and two layers of plastic wrap. Remember to label and date your meal! 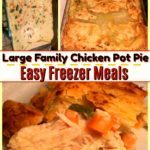 FREEZER MEAL COOKING DIRECTIONS: Set your frozen chicken pot pie out of the freezer and into the refrigerator the day before you need it. When it’s close to dinner time, unwrap your dish and place it in the oven at 350 degrees for 90 minutes. Oven times may vary. You’re looking for your crust to be golden crisp and the filling to be hot and bubbly.